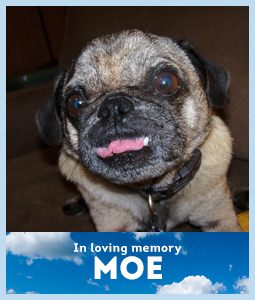 It is with a sad heart that I am writing to tell you that Moe (formerly known as Goliven) passed away this December. We had him for almost three years, and he was the sweetest dog we’ve ever had. Thank you to his foster mom and grandmom, Marcia, and others who helped us connect. He was old when we got him, but so grateful to have a big yard and a cozy place to cuddle. He was at least 13 when he passed. He loved to sit on the rug in the kitchen and oversee any meal preparation. We miss him greatly. Rest in Peace, Moe.